GAM's complete line of bellows couplings for servo applications are among the products detailed in a new full-line brochure from GAM. An easy-to-follow product selection chart – also available at www.gamweb.com -- guides users through bore and torque ranges, hub style, bellows connection method and other major features for each series in the product line. Select couplings offer several unique features. GAM's patented EASY Clamp System prevents damage to hubs and allows easy shaft mounting/dismounting while compensating for tolerance differences between shaft and hub. The patented brass wire press-fit method of connecting the multi-layered bellow to the hub can withstand high-temperature and harsh chemical environments where glued connections cannot. The micro plasma weld connection offers even heat distribution which results in a long-lasting connection between hub and bellow and is ideal for high temperature applications. GAM's bellows couplings are available with torque ratings from 0.44 Nm to 44,000 Nm for use with servo motors. All feature high torsional rigidity, low inertia, zero backlash and misalignment compensation. They can be used maintenance-free at temperatures up to 570¼F without any limitations and at speeds up to 25,000 RPM without additional balancing. 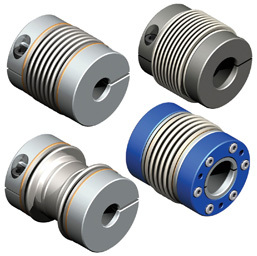 GAM offers same day delivery on several standard and custom bored couplings. GAM Gear, LLC is a leading provider of precision mechanical power transmission components used in the automation of machinery. GAM has a broad product range of gear-reducers, servo-couplings, safety-couplings, and motor mount kits. GAM’s mission is to give our customers what they want and be able to do it in small quantities and at a value to the customer. For more information about GAM visit: http://www.gamweb.com or call 888.GAM.7117.